Georgia Southern University's Herty Advanced Materials Development Center has opened the first fully-integrated pilot pellet mill in the U.S. The new production line, located in Savannah, Ga., includes a nearly $2 million investment in equipment. Scottish Energy Minister Fergus Ewing has announced future support levels for biomass, which encourages smaller-scale combined-heat-and-power (CHP) generation and sways away from large-scale biomass combustion. When Li Tan approached his colleagues at the University of Georgia with some unusual data he had collected, they initially seemed convinced that his experiment had become contaminated; what he was seeing simply didn't make any sense. Scientists studying an enzyme that naturally produces alkanes, long carbon-chain molecules that could be a direct replacement for the hydrocarbons in gasoline, have figured out why the natural reaction typically stops after three to five cycles. On Feb. 6 Rep. Gregg Harper, R-Miss., introduced legislation that aims to amend the Clean Air Act to require the U.S. EPA to based its cellulosic biofuel targets under the renewable fuel standard (RFS) on actual production. Israel-based Rosetta Green has entered into an agreement to sell most of its assets to Monsanto Co. for $35 million. According Rosetta Green, its core technology centers on MicroRNAs, which are short RNA molecules that regulate gene expression. Cereplast Inc., a bioplastics manufacturer, has announced it generated approximately $300,000 in new revenue during the final two weeks of January. According to the company, the new revenue is in addition to the $500,000 in revenue announced Jan. 23. Zero Waste Energy builds dry anaerobic digester in Calif.
An open house was held on January 25 to introduce Zero Waste Energy LLC's first U.S.-based dry anaerobic digester (AD). The system is located at the Monterey Regional Waste Management District, where it will process locally generated waste. On February 1, Amyris Inc. shipped the first commercial order of Biofene from its production facility in Brotas, Brazil. Biofene is Amyris's brand of renewable farnesene, which is processed into drop-in biofuels. California is home to nearly 30 advanced biofuel companies, but dozens of other states from coast to coast also are beginning to realize the economic benefits of this emerging industry, according to analysis by Environmental Entrepreneurs (E2). Driven by aggressive biofuel mandates, rapid growth will cause great strain on biomass by 2030, according to Lux Research. 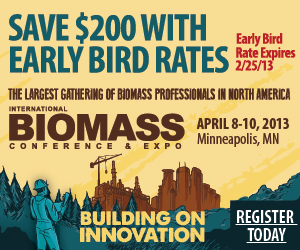 Feedstock innovation will be needed to keep growing biomass's market share. Fourteen finalists have been chosen to compete in the Alliance for Green Heat's Wood Stove Design Challenge in November. The competition aims to develop more efficient wood stoves for homeowners and those in developing countries. The U.K. Department for Environmental, Food & Rural Affairs has announced a new, independent public body will hold in trust the nation's publicly-owned forests. The announcement came as part of the government's response to a recent forestry report. Sen. Lisa Murkowski, R-Alaska, ranking member of the Senate Committee on Energy & Natural Resources, released an energy blueprint that calls for a wide variety of changes to U.S. energy policy, including drastic changes to the RFS. The chief of Naval Research and director, Innovation, Technology Requirements, and Test and Evaluation, visited the Space and Naval Warfare Systems Center Pacific (SSC Pacific) Jan. 29. He received updates on several initiatives, including biofuels. Bloomberg New Energy Finance and the Business Council for Sustainable Energy have released a new report that shows power generation capacity from biomass and waste feedstocks increased from 13.9 gigawatts (GW) in 2008 to 14.7 GW in 2012. Provisions in the American Taxpayer Relief Act of 2012 have allowed biomass facilities to continue to qualify for renewable energy production tax credits, but value language is prompting the U.S. House to seek clarity from the IRS and U.S. Treasury. On Jan. 29, New Biomass Energy LLC announced their third shipment of 4,000 tons of torrified wood pellets to Europe. To meet growing demand in Europe, the company is expanding its plant in Quintman, Miss.